Even if you only Spread Bet infrequently, the ability to save a large proportion of your trading costs can be significant. For many of our customers we give them the opportunity to save thousands of pounds they would otherwise have given to their Spread Bet provider. 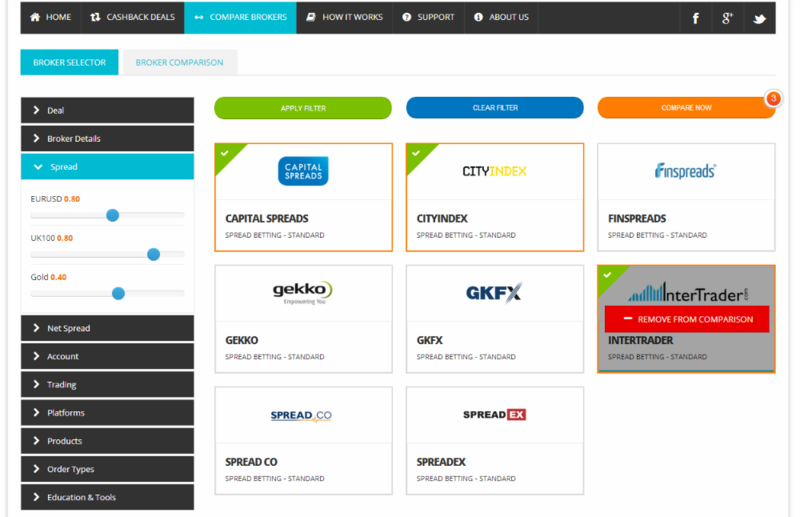 Even if you don't trade yourself, you can earn an income by introducing other traders to Spread Cashback. Every trader you introduce will earn you an additional 10% of the trader's Cashback. If the person you introduce also introducers other traders, then you will also earn an additional 5% of the Cashback they earn. We offer advanced and easy to use filtering tools which assist you in finding the Broker that best suits your needs. Choosing a Broker can be a hard decision, with so many important aspects to consider and different Brokers to choose from. We make comparing Brokers easy by giving you the tools to select the features most important to you. We then display only the relevent Brokers that meet your needs, and allow you to compare all their features in a side-by-side comparison grid. Whether you trade Spread Bets, CFDs or Forex, our listed Brokers cover all the account types you need. Spread Betting offers the advantage of tax free profits for UK residents looking to speculate, wheras CFDs are an excellent hedging tool. Whichever type you are looking for we are sure to have a solution to meet your needs while reducing your trading costs!